As humans we have a tendency to divide our lives and spaces into compartments. This is very useful when we want to keep our dirty dishes separate from clean dishes. But it this same way of thinking leads to cities and suburban areas where we completely remove natural areas for the sake of providing a “liveable” area. In the past we’ve even gone so far as to put our creeks and streams into pipes underneath our houses, draining and filling wetlands along the way. We still like to mow big lawns because lush, green, well-manicured lawns are a social status symbol, even though our lawns are an ecological wasteland. Increasingly we are finding that having separate places for “nature” and for “living” harms our physical and mental health, not to mention the health of the environment. 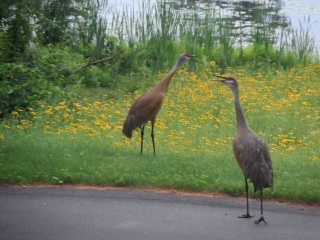 Sandhill cranes on the shores of Lost Lake Nature Park. As humans use more wildlife habitat for our needs , cranes and other wildlife are forced to use these areas that we’ve altered. How can we make our “improvements” friendly to wildlife and native plants? Photo by Angela Fox. Many groups have recognized this problem and are working diligently to help us find ways to bring nature back into our built infrastructure as rain gardens that act as passive filters for storm water, native plantings that provide beauty for us and habitat for pollinators, and corridors that reconnect natural areas and allow wildlife to move between them. We can bring nature back closer to us by planting native species in our landscaping. Maryann Whitman sent me information about the upcoming Wildflower Association of Michigan Conference in East Lansing March 8 and 9. If you’ve been wondering how to get started with native landscaping, or have been doing this for years and want to up your game, this conference will be a good fit. Visit http://www.wildflowersmich.org/index.php?menu=5 for more info. I’ve found that planting native plants in my landscaping provides a great opportunity to learn about that plant and see it change through the seasons. The grand finale, this milkweed takes the show. 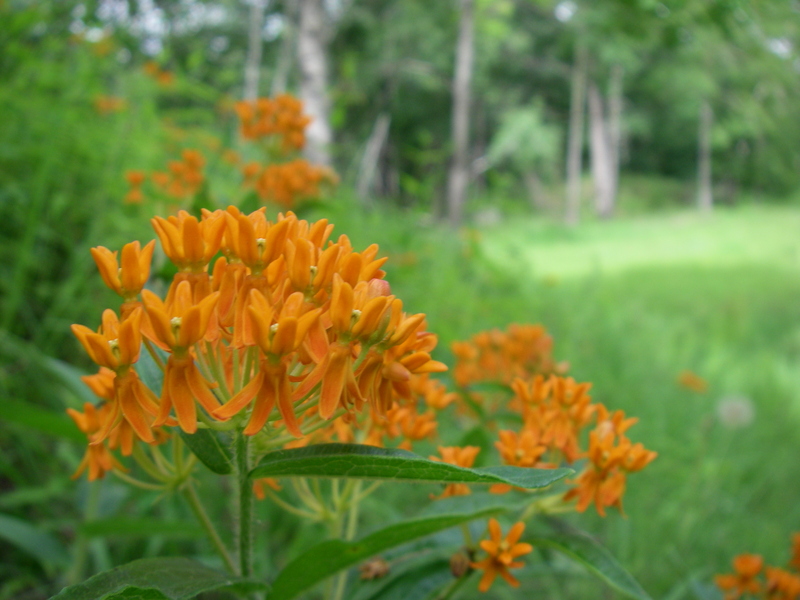 A beautiful milkweed for your garden, this species form clumps instead of spreading widely. On the other side of the coin we sometimes expect our natural areas to look like gardens. Mowed paths winding through fields of manicured wildflowers, not a weed in site. But in an excellent post earlier this week, Chris Helzer with The Nature Conservancy in eastern Nebraska challenges us to think about the value of the “ugly” places in our natural areas. These areas might not fit our preconceived ideas of beauty, but they often play an important role in providing a diversity of habitats that allow many plants and animals to exist side by side. Check out The Prairie Ecologist blog (http://prairieecologist.com/2015/02/04/seeing-past-the-ugliness/) to read more. I try to practice what I write, so consider volunteering to tend a native plant bed or control invasive plant species if you’re interested in learning more about applying these techniques on your own land or landscaping. Let’s bring nature back home! 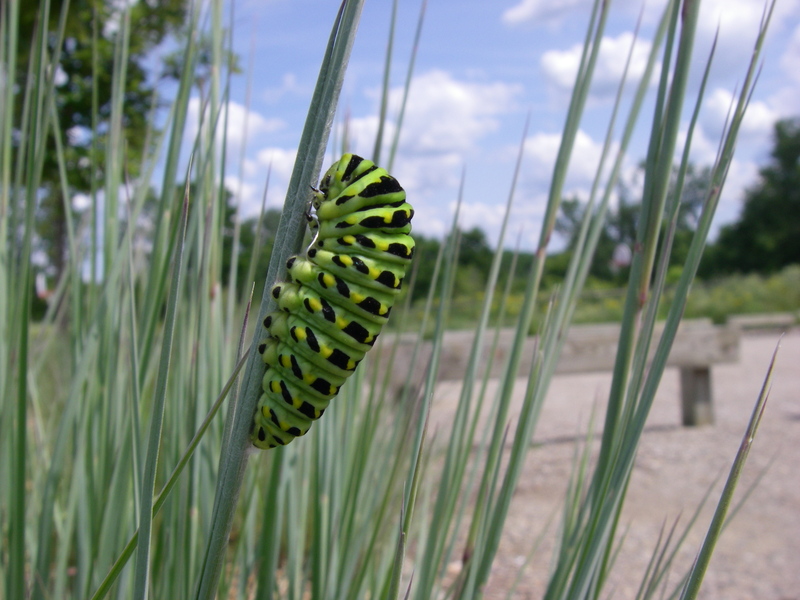 A swallowtail caterpillar I found in the native plant beds in the parking lot at Marsh View Park in summer 2014. What a great shot of a caterpillar, Ben! I’ve looked for those big, fancy ones many times but never seen one that spectacular. A nature photo display by people in Oakland Township might be a fun activity some time. We are doing a landscaping project this spring. We took out all our overgrown shrubs in the front. Have no idea what to plant this spring! Deer, maintenance, native, dogs and cohesiveness all in play. Thanks for great sites to look at to start some planning. Maybe it will help to make spring come faster! Wish I could learn of specific wildflowers that I could plant in the wooded area that the deer would not eat? Prairie Moon Nursery is a wonderful resource for both knowledge, plants and seeds. Hi Karen! I love to look at the Prairie Moon materials for ideas and info! I usually try to buy plants or seeds from somewhere close to home – if you’re in Michigan the Michigan Native Plant Producers Association website (http://www.mnppa.org/) has a nice list of producers. Do you have a favorite native plant you use in your gardens? Hi Barbara – I found a nice tool online to help fine deer-resistant native species. The Lady Bird Johnson Wildlflower Center tool (http://www.wildflower.org/collections/collection.php?collection=deer) lets you select your state (MI) and the amount of sun (shady), then generates a list of suggested native plants. Ben this post warms my heart on a frigid morning. The Wildflower Association of Michigan has an Education Grant program, offering grants to teachers to plant native plant communities in an ‘outdoor classroom’. I just wrote a note to a teacher/grant recipient who applauding her efforts. She mentioned that some parents have referred to a ‘new aesthetic’ in their gardens. The gardens are not only meant to please the human eye but also attract some of the other lives that populate this planet with us. And aren’t we OT residents lucky to have natural areas to visit with our children to see some of these “other lives”. thanks for all you do Ben.